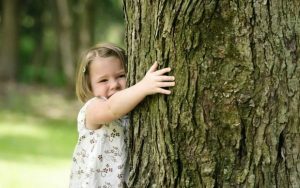 Once the catchcry of nature loving ‘hippies’, GO GREEN has become a global movement and going green has become serious business. In the building industry, regardless of whether it’s a brand new home or renovating an old weatherboard, today’s environmentally aware home-owner wants eco-friendly and value for money. It’s all very well for building material suppliers to say, “Ah, but we source timber from dedicated timber plantations.” Unfortunately, not every country does that, and some 46-58 thousand square miles of natural forest are lost each year – equivalent to 48 football fields every minute – according to worldwildlife.org. The problem with trying to do the right thing is not everyone can afford it upfront and they don’t understand the false economy behind choosing the cheapest option first. Items that are marked biodegradable or energy efficient, for example, are much more expensive than their less environmentally aware counterparts. The same applies to the majority of ‘green’ products. So how do you renovate ‘green’ while on a budget, and is the added upfront expense justifiable? If it ain’t broke, don’t fix it. Sometimes, you have to compare the end result and environmental impact of throwing out and replacing a perfectly good appliance, or furniture, with something new and shiny. This applies to everything, including floor and window coverings. Save your money and the environment and only replace as needed. Need vs want. Don’t waste spare cash on trendy wants. Keep to the needs on your list – plenty of time for luxury spending later when you can afford it. Investment in something that will save you money over the lifetime of the product makes better sense than buying something now because it’s in fashion for a season. Recycle.Reclaimed pavers, timbers, window and door frames are not just for the budget conscious. It is good sense environmentally to use recycled materials from demolition companies, and likewise, you may be able to sell (or donate) your own unwanted materials. Need to buy new materials? Sometimes it is unavoidable, in which case insist your builder uses materials with low environmental impact – that is, it does not have a negative impact on resources that are not renewable or not easily renewable and does not negatively impact on the environment, wildlife or human health and wellbeing. Be superficial – facelift! Some items don’t need to be replaced and can be given a new lease of life with a simple coat of paint. Remodelling your kitchen? You don’t HAVE to throw the entire thing out and start from scratch. Consider just replacing cabinet doors and bench tops. Ditto old houses – why destroy what can be given a new lease of life with more cost and environmentally effective means? Are there financial incentives? Depending on the State you live in, your State Government may offer financial incentives and rebates for switching to energy saving systems and appliances. Find out more about incentives for saving energy. Insulate. There is little sense in investing thousands in a ducted air conditioning system if your house leaks at window and door openings and your ceiling is not insulated. A well-insulated home will retain warmth or coolness much more efficiently and cost-effectively than a non-insulated home – good for the planet AND for your wallet. Go Solar. Solar panels need little introduction. If you can afford it, include solar panelling in your budget – you will get your money back and then some, especially if you are power-savvy and continue to pay attention to power saving rules. Let there be light! Before installing even more light fixtures and fittings, consider extra, well-placed window placements and skylights. Compare flicking on a light switch versus opening a curtain. Need we say more? Be Water Wise. In addition to buying white goods that are water efficient and energy efficient, consider rainwater tanks and a system for more efficient use of runoff from rain in winter, plus water efficient tapware. Also, check your government water authority for your state’s rules on the use of ‘grey water’. At this time of year, a popular renovation is decking, and an excellent example of how spending extra now can save you later. More environmentally-aware consumers combined with advances in technology have seen a rise in the introduction of recycled timber composite products. Companies like NewTechWood use recycling technology in the manufacture of their composite decking, cladding and screening products and every month their efforts alone are saving over five million kilos of plastic from being buried in landfills and saving forests into the bargain. NewTechWood composite timber is manufactured with 60% carefully selected recycled timber and dense wood fibre, and 40% high-grade recycled plastics (HDPE) that allows for greater strength and durability. And the ‘greening’ doesn’t stop there…NewTechWood composite has an advanced premium shield encasing ALL four sides around its inner core. The shield and core are extruded together under a very high-temperature mould simultaneously, so there are no adhesives or chemicals used that are harmful to the environment. This protective shield means there is no need for oil, paint or seal your NewTechWood deck – ever… thus still no need for hazardous chemicals – ever. As the years go by, this is great news not only for the environment but also for your wallet. NewTechWood composite does not release any harsh or toxic chemicals into the air and because it is termite resistant you never need to worry about expensive and toxic termite treatments either. 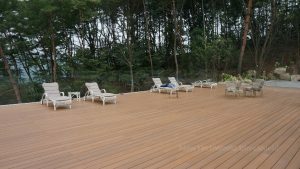 Yes, it costs more upfront than real timber from real forests – but the environment will thank you and you’ll definitely save over the lifetime of your deck! For more information browse the website or contact us.